SAN FRANCISCO, CA--(Marketwire - February 3, 2010) - BrightRoll, the leading branded video advertising network, today announced it is now larger than both Hulu.com and the Hulu Network in number of monthly unique visitors, according to measurement firm Quantcast. 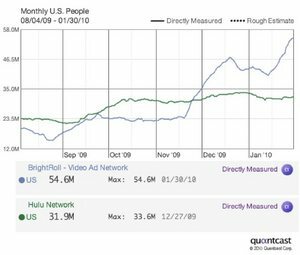 According to Quantcast, BrightRoll's premium video network reach has grown to 54.6 million unique viewers per month in the United States, far surpassing the 31.9 million unique visitors reached by the Hulu Network, or the 20.8 million unique visitors reached on Hulu.com. "Hulu has long been considered a safe choice for advertisers looking to reach broadcast-quality audiences, yet our advertising customers continue to seek a more efficient way to reach these audiences at scale and across a broader spectrum of branded inventory," said Tod Sacerdoti, BrightRoll's founder and CEO. "Proving our scale, particularly relative to Hulu, validates our unmatched reach of premium video inventory and makes BrightRoll an ideal solution for marketers looking to execute large-scale, brand-safe video campaigns for either long-term, upfront commitments or for short-flight, tactical objectives." As an alternative to broadcast and Web upfront buying, BrightRoll offers advertisers unparalleled reach and access to target consumers across three-quarters of the Web's top 100 video publishers. The company's network of high-quality sites serves as the basis for real engagement with well-defined audiences at a fraction of the cost of television buys. BrightRoll's measurement tools and innovative advertising programs have long been helping brands to make the transition from television to online. Most recently, the company launched its Performance Pricing program, giving advertisers a range of engagement and performance-based advertising options instead of defaulting to the standard price-per-impression metric. In May, the company launched Video Impact, allowing brands to measure the offline sales impact of the campaigns they run with BrightRoll. The company has seen tremendous success with global CPG brands like Reckitt Benckiser, which teamed up with BrightRoll as part of the company's $20M marketing budget shift from television to online. BrightRoll, the leading branded video advertising network, is clearly now larger than the Hulu Network, having surpassed Hulu in monthly unique visitors, according to measurement firm Quantcast.